Method: Clean, devein and wash Shrimp. Remove the stems from the spinach, wash, chop and set aside. Add the ginger garlic paste, salt, turmeric and red chilly powder to the shrimp and leave to marinate for 10 minutes. Heat 1 tablespoon oil, add mustard seeds and when they begin to crackle add dry red chillies, curry leaves, fenugreek then chopped onion & chopped green chillies. Fry till the onions turn translucent then add the marinated shrimp. Add chopped tomatoes, coriander, cumin, turmeric & chilly powders and salt. Stir fry the shrimp in this masala just till it becomes opaque. Remove the shrimp and keep aside. The shrimp will become rubbery if you let it cook with the spinach. Now add the chopped spinach to the same pot, give it a nice stir then pour 1 cup of water and cook till the spinach softens. 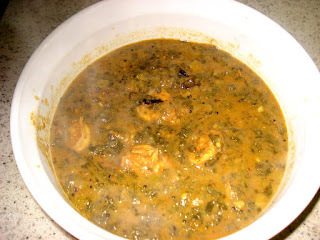 Mix and mash the spinach well till it attains curry consistency. Transfer the cooked masala shrimp to the pot. Soak the tamarind in water, squeeze the juice and add it to the spinach shrimp curry. Adjust the salt, add a lttle more water if it is too thick. Garnish with chopped coriander and serve with boiled rice.